Our Skin Clarifying Acne Pads are formulated with even more nature-powered ingredients. Combining the skin soothing effects of Aloe Vera with the anti-oxidant rich properties of the astringent Witch Hazel, ClarityMD Skin Clarifying Treatment Pads help prepare the skin for our Clarifying Serum and help to BOOST your clear skin results. For a skin-clarifying boost, use a few times weekly and increase use as desired. Great for skin clarifying on-the-go. Cleanse skin thoroughly with Deep Pore Cleanser. Wipe pad over face, focusing on blemished areas. 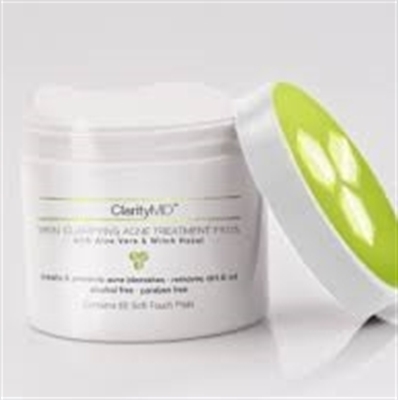 Allow skin to dry and follow with Clarifying Serum.